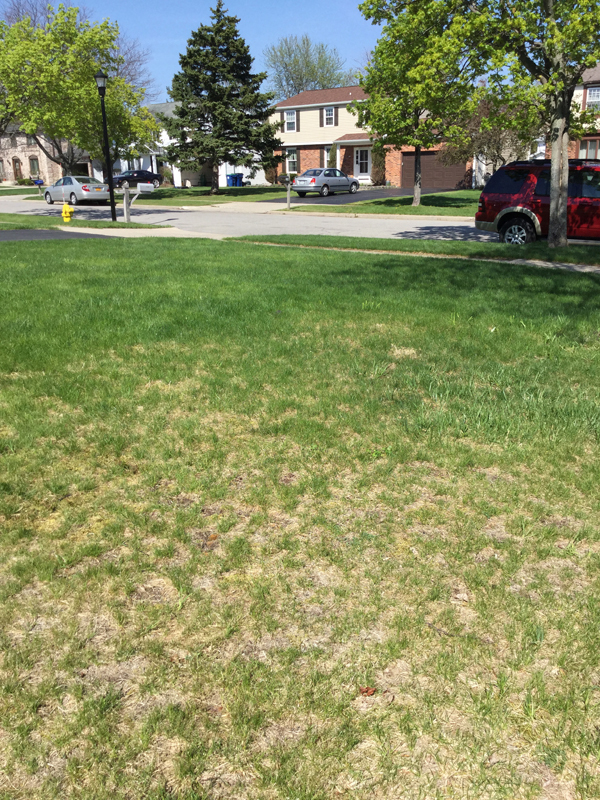 Can you help this reader with a lawn problem? A reader came to me with a gardening question. Do you have any suggestions on how she can resolve her problem? If so, please leave a comment. 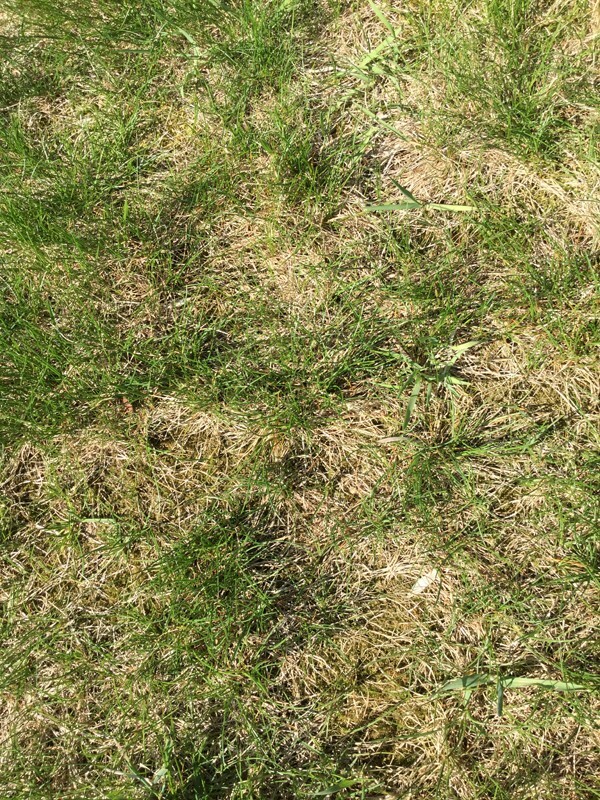 I have an area of my lawn that has had moss, bare spots and grayish/brown grass for several years. It isn’t getting smaller despite suggested treatments from my lawn maintenance company. They recommended lime but it didn’t work. They tested the pH and it is within normal limits of 6-7 pH. There is good drainage, it is not a low-lying area and doesn’t have more than an average amount of snow cover in winter. It gets plenty of sun. This company is unable to provide any other treatment. I talked to a different person and they suggested it was a fungus but were unable to provide a treatment suggestion. Sometimes readers contact me with questions that I can’t answer. I’m not a gardening expert– I’m a writer by profession. I interview knowledgeable people in order to provide you with great articles on Buffalo-NiagaraGardening.com. So when someone asks a question I can’t answer, I post the question and rely on my readers to share their expertise. If you have advice for Martha, please leave a comment below. If you want to know the answer to these questions, check back later to read the comments. For Master Gardeners at Cornell Cooperative Extension Erie County, call (716) 652-5400 from 9 a.m. to noon weekdays or email them at mgeriecce@gmail.com. For Chautauqua County, email your question to CCEMGCC@gmail.com; call the Helpline at (716) 664-9502, ext 224, or stop in to the Frank Bragg Ag Center, 3542 Turner Rd., Jamestown, from 1 to 3 p.m. Wednesdays. The businesses that support this magazine have very knowledgeable staff. Check out our Gardening Directory or click on an ad to get their contact information. Could there have been a black walnut tree in the grass problem area at some time in the past? The Chautauqua County Master Gardener Help desk is open every Wednesday from 1 -3 pm, not the hours listed above. We are located at the Frank Bragg Ag Center on Turner Road in Jamestown. When a plant is struggling at any phase of its life cycle always go below ground to examine soil conditions. Sounds like you’ve been given proper advice in this regard in terms of pH, although the issue may have more to do with lack of oxygen to the roots. This could be from compaction over the years of foot traffic, so aerating is one suggestion. Application of NPK fertilizers and pre-emergent weed control can deplete beneficial soil microbes, which break down trimmings into compost. Aerate and top dress with a peat moss mix of grass seed before the heat of summer. Also, mowing slightly higher than industry standard of 2.5″ will promote a healthier turf. I mow at about 3″ and use mulching blades. We’ve seen our lawn thicken over the last several years without any fertilizer. An application of milorganite wouldn’t be a bad idea. If all else fails and you want a more immediate dense turf to establish, stripping the problem 2-3″ below grade and applying fresh topsoil with seed, or sod, would be an effective, albeit bit more expensive solution. I had the same problem in my front yard When I bought my house in 1991. For a couple years I watered it fed it to no avail. Then I dethatched it with heavy raking pulling up all the dead looking grass. I also aerated it with a aerator attachment I bought for my lawn mower. I put weed and feed on it every year. This year my neighbors said what do you put on your lawn it looks so good. It took a couple years, about 2 before I noticed a significant difference. All suggestions seem plausible, but could the lawn company be the problem? Improper chemical application, over fertilization, ill timing, are things lawn services can do. Also if a company has treated for many years, grass gets thin and anemic looking. Dead soil equals malnourished plants. I had a similar problem in one area of my back yard. The problem turned out to be old roots under the soil. You may have to start digging. We have had the same problem and our lawn service calls it snow mold. They recommended that we rake the lawn, they do their regular spring treatment and the lawn does get back to normal. Hope this helps. Thanks, Peg! I have made that correction. I had the same problem in my front yard 2 years ago. It was a fungus. I had to remove the dead grass and a layer of soil which was white under the dead grass. New top soil and grass seed were put down and now my front yard looks great! Thank you all for your comments. This one in particular, about the fungus, is the closest to our problem. A Lockport Lawn company, Turf-Tec, did respond to my e-mail, sent a Tech to our house AND has a treatment plan. The Tech said that the soil in this spot is particularly dense. The Tech also said that Lime really doesn’t do anything helpful for lawns. Ah, finally a good plan. An application of compost with beneficial soil microbes wouldn’t hurt the cause. I do hope you allow dandelions and clovers to flourish in your lawn for our declining honey bee population.